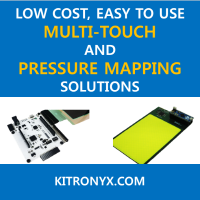 EtherTouch sells 12 channel 3D capacitive touch sensing IC (AD7103) and evaluation kits. Due to a carefully designed sensing circuitry, AD7103 can detect human body far from the sensing electrodes by which one can make more interesting interfaces such as touchless touch UI. Unfortunately, the company seems to cease operations as a business at this point.